We knew that all that glorious sunny weather we were having the first two weeks we were at Heceta Head wasn’t normal and that eventually the rain would return and sure enough it did. On Tuesday May 12th it rained most of the day. We spent the day in town at the library using the internet and doing our grocery shopping while the folks manning the lighthouse had their hands full with tour after tour all afternoon–highly unusual this time of year during the week. The weather was better the next day and we even had a sun break or two while I did the laundry. We spontaneously went off on a hike on the China Creek Trail that starts in the campground. It was a nice hike but I forgot the camera so I can’t show you the nifty red/orange salamanders we saw or the HUGE black shelled snails we saw crawling along the trail (one as big as my fist). We managed to take the wrong fork (a bit of trail that in retrospect was clearly not the main trail) and ended up crawling over huge logs and roots and then running into a big mud hole so we decided to turn around. But it was great to get out even if it was only for about an hour while the clothes dried. 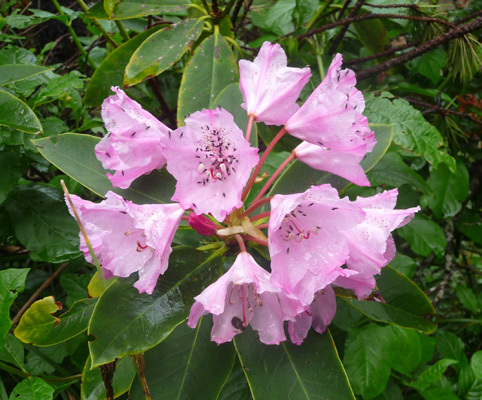 Meanwhile the native rhododendrons in the campground had come into bloom. And the bugs certainly had gotten the message. This bush was right across the road from our campsite and I didn’t notice until after I took the photo that it was alive with bugs. Wednesday evening all the hosts got together again for a campfire and this time, we played “How I love them old songs” by Mickey Newberry. Walter played the loaner guitar we picked up on Monday when we took his guitar in for repair (a very nice Taylor) and I played the autoharp. A good time was had by all. We’re having so much fun doing this, we have the songs for the next two weeks all picked out. On Thursday May 14th, we began the day with an safety meeting with all the hosts (I know you wait with baited breath to hear things like this) and then we high tailed it back down to the lighthouse to work the morning shift. We saw a couple of whales and did our usual 3 or 4 tours but it wasn’t particularly busy. It was warm enough so I even took of not only my raincoat but my fleece too! That’s a first. At the end of our shift we headed south towards town to check our email and ended up in the Fred Meyer parking lot (on the north edge of town) because everywhere along the way where we started out with a green signal, it quickly turned red. At least when you get to town you know you’ll get a signal. Friday started out with the big excitement of our parking pass for the Day Use Area where we park when we’re giving tours finally arriving. The passes had to come from Salem so they took a while. Meanwhile we’d had to just leave a piece of paper on our dashboard with a note on it that we were Lighthouse hosts so we wouldn’t get a ticket. So getting our passes was cause for big excitement along with getting our mail delivered right to our site by the Camp Host. No trip to the post office for General Delivery here. They allow us to use the park address to receive mail so we’ve even ordered a few things we needed and gotten them okay. The day started out damp and misty and stayed that way most of the morning. We’d have a minute or two when we’d see a bit of blue sky but the mist was heavy enough that the benches up by the lighthouse were all wet which made sitting down to rest a moment or two a bit problematic. And believe it or not we had the busiest morning we’ve had since we arrived. We gave one tour after another from the moment we arrived until well after 2 pm when we headed back down the hill. We barely had a minute to sit down before our next tour would start. It appears that when it rains, everyone who might otherwise be out climbing on rocks, playing on the beach or hiking, heads up to the lighthouse instead. People had told us that this happened but now we’ve seen it happen twice (big time) and it’s becoming clear they were right. We ate our lunch in the truck with a view of the beach (running our wipers now and then so we could see) and then drove south to the Darlingtonia State Wayside which is just north of Florence. 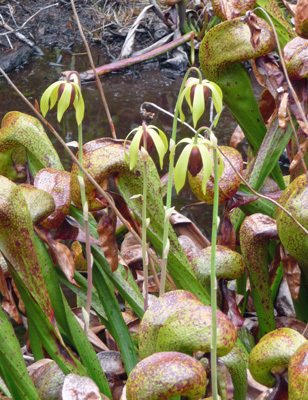 We’d heard from one of the other hosts that these insectivorous plants were in bloom so we had to go see. 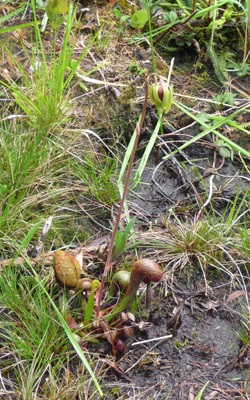 Last summer we had gone on a hike at Sutton Campground (just across the highway from this state wayside park) where we’d read about these plants but we didn’t see any. This time we were not disappointed. In fact there is a whole bog FULL of them. 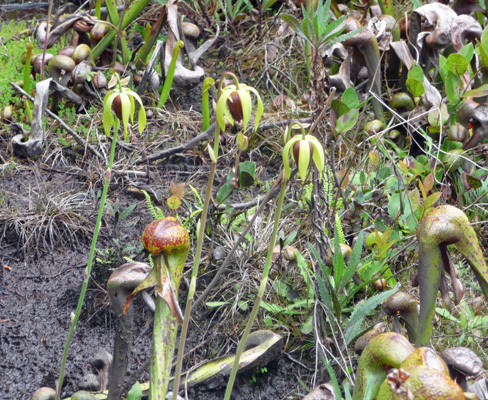 Darlingtonia californica are also know as cobra lilies. And you can see why. 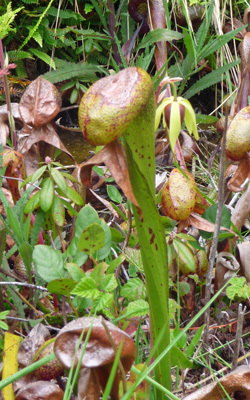 Their leaf structure consists of this hooded growth with forked appendages that hang down. The forks and the edges of the hood have nectar on them which attract insects. Once inside the insects become confused by the light that comes through the dark speckles which look to them like exits. They have trouble keeping a foothold on the smooth walls of the upper hood and end up falling down the hollow tube past a series of sharp downward facing hairs. 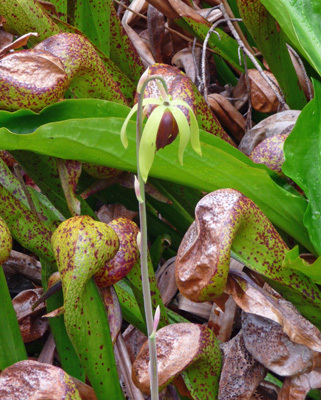 Eventually they fall into a pool of liquid in the bottom of the leaf tube and are digested and consumed by the plant. Ewwww. Most of the plants were in bloom showing off their downward facing burgundy flowers with bright yellow sepals. Here’s a shot of one with it’s leaves just beginning to unfurl while the flower is fully in bloom. They are most definitely cobra-esque. There were flowers in clumps all over the place. I had a great time taking photos of them. Eventually the flowers will set seed. We saw a few seed pods still on their erect stems left over from last year. This was a great little outing. The place is right next to Hwy 101. 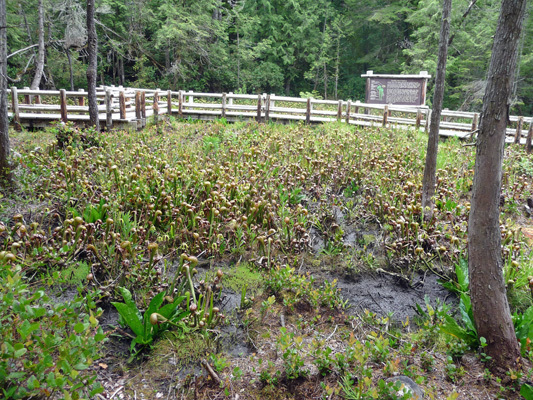 The walk is about a 1/4 of a mile and there’s boardwalk through the bog. And it stopped raining while we were there too. Saturday morning it was cloudy but we didn’t have much mist. We were working the morning shift again. There was a pretty good-sized wedding going on down the hill from us at the Bed and Breakfast that’s in the old Assistant Keepers’ House. They had matching umbrellas for the guests as they sat waiting on the lawn but the rain stopped just as the ceremony began. We had a quiet morning—much quieter than either Thursday or Friday probably because it wasn’t raining. We had a pair of whales swim by—one looked like a calf. And for the second day in a row the common murres who have been missing so far this season, came swimming by in a big raft formation and a few even flew up to the big rock to check things out. Usually at this time of year they are nesting on the rock but they’ve been missing and our Fish and Wildlife hosts haven’t had much to talk to folks about. So they are greatly heartened to have some sightings. Common murres look like flying penguins and are great fun to watch. But our big excitement came at the end of our shift when our name tags finally arrived. We’d been warned that there were hang ups with the vendor so we didn’t know if we’d even get them before we left, so all the hosts were celebrating at finally no longer having make-shift tags (Walter was wearing his old soccer coach tag) or none at all (me). So at last we are fully official. We have hats, vests, name tags and a parking pass and we’re only half way through our month here. Not bad. We bought the little Heceta Head Lighthouse pins that are just above our name tags ($5 from your lighthouse tour guide). 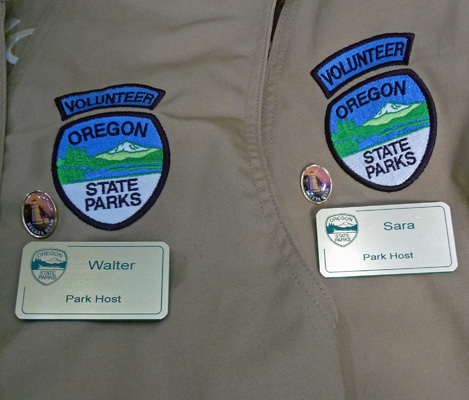 On the coast, many parks have them and the camp hosts collect them to wear on their vest. The sun came out in the late afternoon on Saturday and it was great to have our campsite lit up with the afternoon sun after so many cloudy damp days. Carl G Washburne State Park is a great place to camp. It’s very quiet and there’s nice spacing between the campsites. There are lots of full hooks ups and a number of good sized spots (50 feet or over) that can take pretty big rigs. There are 57 spaces plus a hiker/biker area and a walk-in tent area. The nearby beach is a lovely long sandy beach with very few folks on it. This is Oregon so the showers are free. The only hitch is that they are the kind where you push a button and it turns on the water for a short time and you have no control over the temperature of the water. I’ve been using the shower in our trailer but Walter braves the unheated bathroom and uses the showers. There are 3 showers in the Men’s bathroom in the B loop. One gives you 6 seconds of water before it shuts off. The other 2 run for 15 seconds before they shut off. He says that it takes 3 or 4 cycles before the water is warm. So he just keeps pushing the button while he gets undressed and it’s ‘warm enough’ by the time he’s ready to go. I may have to take a Navy shower and watch how much water I use in the rig, but I’ll take that over pushing a button every 15 seconds, getting out in a drafty shower area and then hiking back to the rig with wet hair. Spoiled rotten, I am. Of course, the real drawback for some folks to camping here is that there is no cell signal in the campground. This hasn’t been a great trial for us. Occasionally we have managed to get a decent signal across the street at the Day Use Area or in the Day Use Area at the foot of Heceta Head. Sometimes we’ve had to head to town. Having a break from the internet is actually kind of nice. But the lack of signal is one of the reasons folks will turn down Lighthouse Host jobs here. In addition very few of the sites pick up satellite TV which is also a problem for some folks. Sunday May 17th, was cloudy in the morning and it was very quiet up at the lighthouse on the morning shift. In fact we had no tours at all the first hour, just folks walking up the hill with their dogs. There were four of us on duty and we each only gave 3 tours a piece—mostly with 4 people. The sun came out at about 1:30 and people started to appear but there were still not a lot of folks when we headed back down the hill at 2 pm. But we did have a big surprise waiting for us on the trail. Walter’s old fellow co-worker, hunting buddy and dear friend, Bill Shrader and his wife, Marti, were hiking up the trail to see us! They live in Lakeview OR (on the east side of mountains near the California border) and had come to the coast for a visit and while they were here had headed up the trail to surprise us. 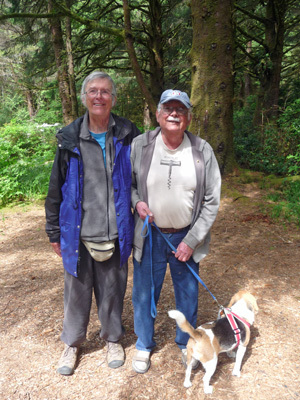 He and Walter have known each other since 1964 but hadn’t seen each other in nearly 30 years. They were happy to meet us on the lower section of the trail so they didn’t have hike all the way up. And since they weren’t interested in heading up to the lighthouse, we took them back to the trailer for a visit. I got the two guys to pose for a photo in our campsite with Bill’s dog, Arrow, who was clearly more interested in the squirrels and birds over there in the bushes than he was in having his picture taken. We hope to go visit the Umpqua Lighthouse just 20 miles south of here to take a tour during our days off this week. It’s built from the same plans as Heceta Head but it’s about 5 feet taller and only has a 2nd order Fresnel lens instead of the 1st order lens that’s in Heceta Head. Time seems to be galloping along. Next weekend is Memorial Day weekend. All ready!